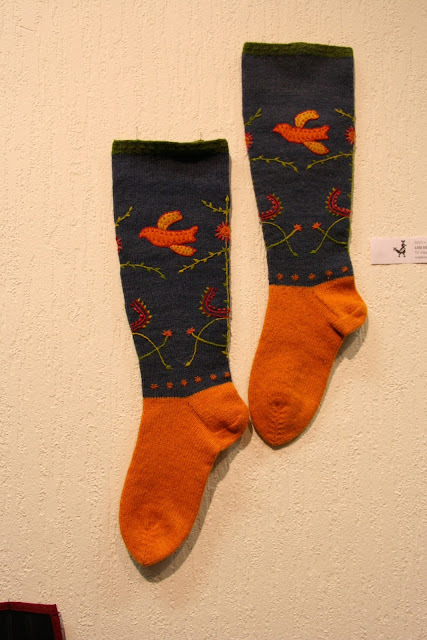 creina moore ceramics blog: Tallinn, one foot in the past, one in the future. 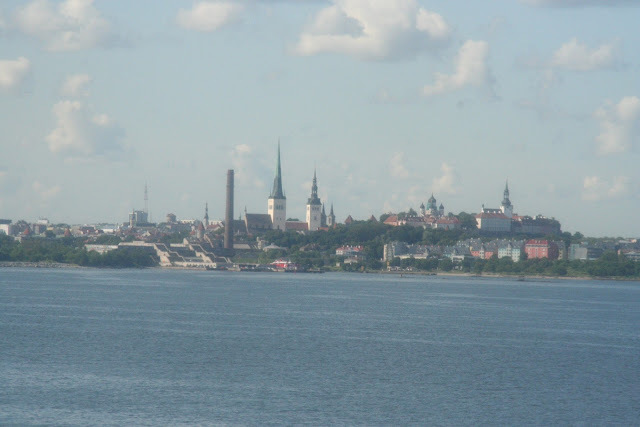 First view of Tallinn from the ship. As usual Geoff and I can't stop ourselves when it is clear that we should take it easy we just keep going. 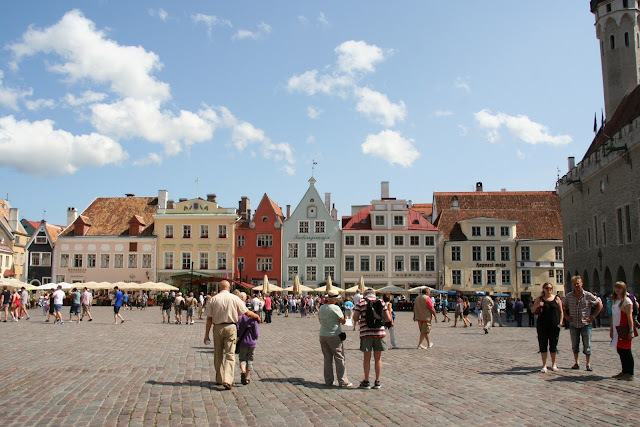 Yesterday after only a few hours sleep we hit Tallinn at around 10am. After dumping our bags we were off to the old town not far from our over the top American hotel. 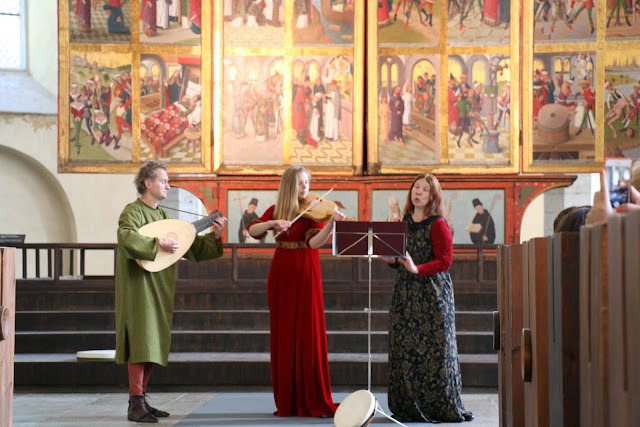 Out first stop was an old church that is now a museum and we lucked upon a recital of medieval music and singing. A drummer, a type of violin with one less string, a hurdy gurdy and a lute. It sounded magical in the lofty church. The earliest reference to this church, St Nicholas, was in 1315. It suffered terribly throughout the centuries, eventually being destroyed in 1944 by soviet bombers. It was rebuilt starting in the 1950's but in 1982 fire destroyed the spire. 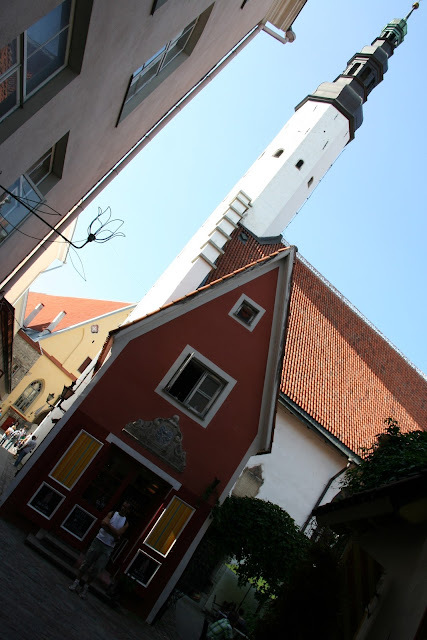 The history of the church reflects the history of Estonia. It developed as a free and independent nation in the 13th C. However in the 1200's it was conquered by the German crusaders and remained under foreign rule for 7 centuries, held by Germany, Denmark,Sweden,Poland and Russia. The first period of National Awakening began in the second half of the 19th C leading to the National War of Independence in 1918. 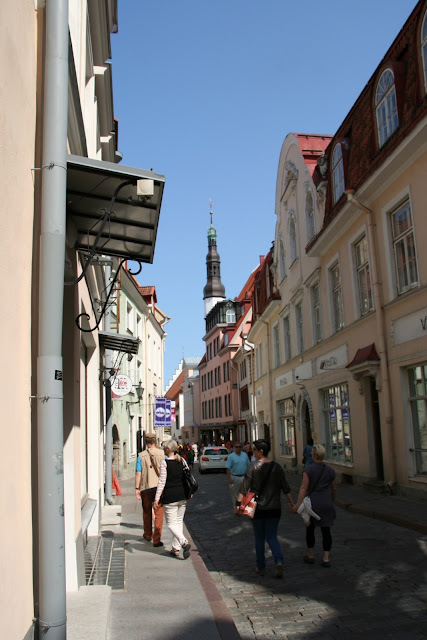 In 1940 Soviet Russia occupied the country and Estonia suffered repression until 1991. This time independence came without a drop of blood being spilt. 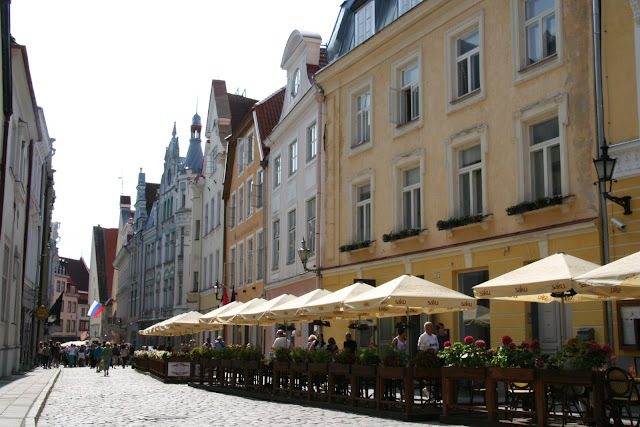 Of course we have only experienced Tallinn, but we feel Estonia is still a country in transition. On the street you see faces of older people, probably the same age as me, whose faces and bodies show the evidence of a hard life from years of Soviet rule. It makes me aware of my cushy life. Even the town has distinct periods, the old, which was changed by invaders but still appears old. Then there is the Soviet period with austere, heavy, blunt shaped buildings, and now here is the new age of tall, glassy hotels with American names and the harbour is a constant shuffle of huge cruise ships like the one we were on. Every day these monsters invade and disgorge their thousands of tourists who fill the old town, shopping, eating, or roaming in packs following a tour guide holding up a number. Those who can't manage the ankle spraining cobblestones climb on a bus and tour the city until it is time to get back on their ship. 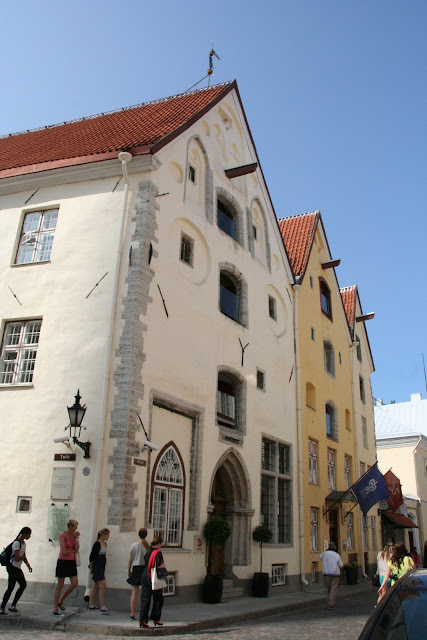 Tallinn is a beautiful town, that is the old part. It reminds me a lot of St Petersburg only smaller and less grand. Peter the Great built a palace for Catherine here and it sits in vast parklands. 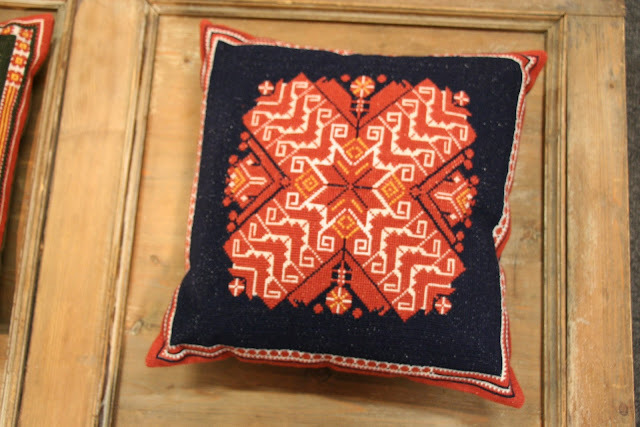 Crafts are everywhere. Linen is prolific. 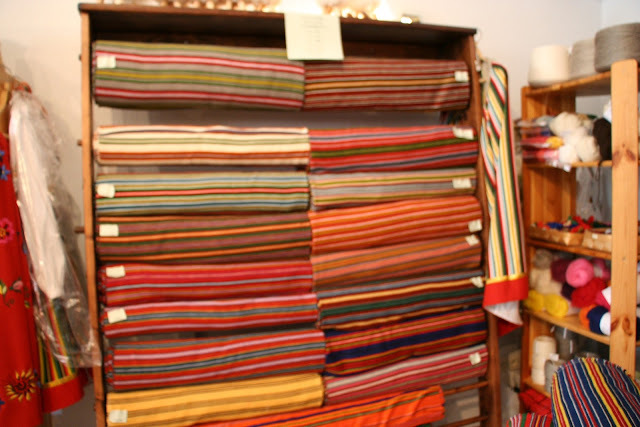 It is usually a natural beige colour, and there are many shops with clothes, table cloths and anything you can think you might be able to make from lines. 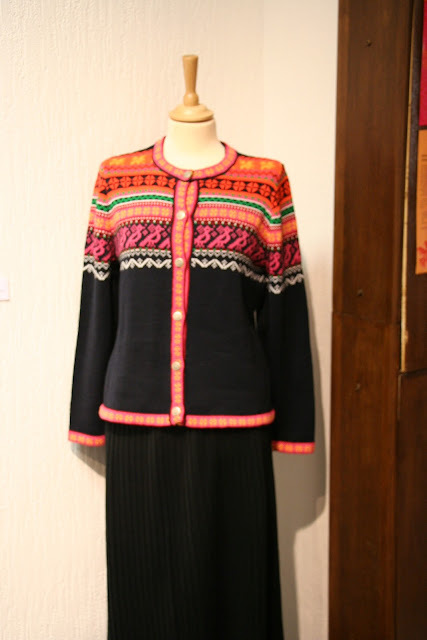 The colourful, traditional woven cloth is beautiful, it would be nice to have an unlimited supply of money and baggage space for these beauties. Amber is everywhere as well. Geoff tells me the Baltic region is home to 80% of the worlds known amber, dated from 44 million years ago. Of course there are beautiful wooden products as well, Kate can tell you that I find it hard to walk past a cheap wooden butter knife. Well Kate, if you're reading this, the town has lots of them here as well!!! 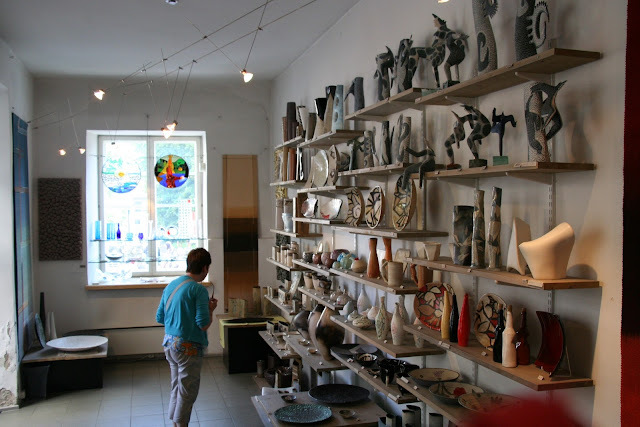 There are a few "Keramik" shops but Estonian pottery doesn't hold a huge appeal for me. 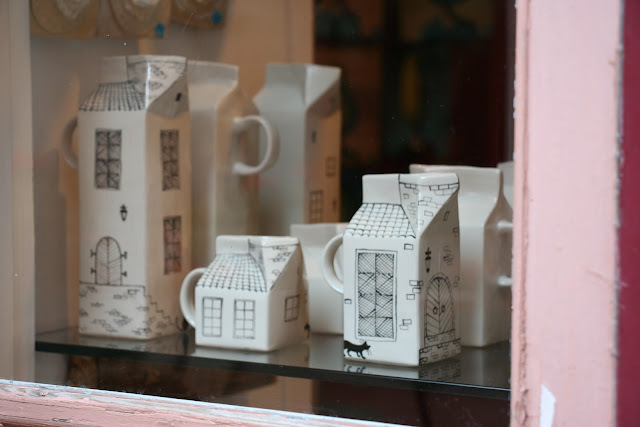 This particularly design is very popular, milk cartons with handles.